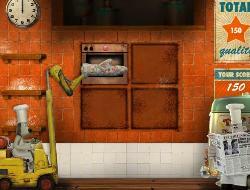 Can you successfully manage the Wallace and Gromit bakery "Top Bun", as you take on the frantic challenge of preparing, cooking and delivering their baked goods. Based on the antics in the new film "A Matter of Loaf and Death", take control of Gromit as the orders begin to pile up. Ensure the dough enters the right ovens, receives the correct topping, bakes on time and is placed in the van before it starts to burn. 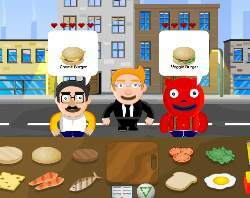 A variety of bakery upgrades and challenging demands will test your limit across 8 levels. Use the mouse to click, drag and move. Click here to send Wallace & Gromit : Top Bun to your friends using your default email program.